DaJuan Coleman scored 15 points against North Florida on Saturday evening. 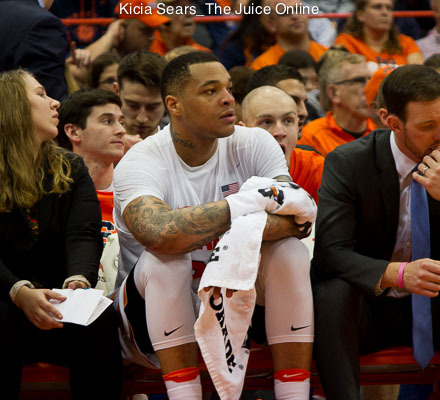 Syracuse center Dajuan Coleman’s career-high in points during SU’s squeaky 77-71 win against North Florida showed that perhaps the veteran player is finally coming into his own. Coleman scored 15 points on 6-10 shooting, grabbed six boards, and showed some aggression around the rim, drawing two fouls in the last three minutes of the game. It was his second game in a row with double digits, the first coming with a 12-point performance in a loss to Wisconsin on Tuesday. Those two games may be a harbinger. “I might have to be more aggressive once we get tougher teams,” Coleman said. Coleman has had some roadblocks to finding his place on the team. He missed eight games his freshman year, most of his sophomore year, and his entire junior season due to knee injuries and subsequent surgeries. Last year, he started every game but averaged just under five points per game and averaged just over 17 minutes per game. This doesn’t come as a shock considering Boeheim’s meritocracy regarding playing time. In past seasons, Coleman has just looked slow and more timid than you’d expect for a player at 6’9 and 270 pounds. 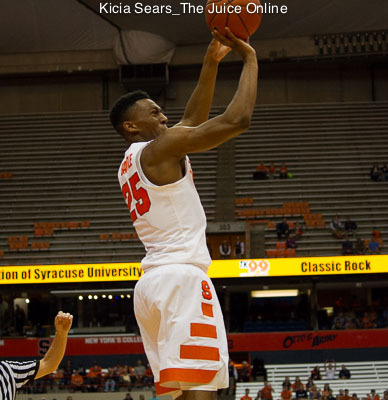 This year, Coleman shares the center spot with redshirt sophomore Paschal Chukwu and sophomore Tyler Lydon. As the most experienced, he’s under pressure to set the tone for the position and earn his minutes against the 7-footer and the dynamic shooter. For his part, Coleman is eager to show he can score. This isn’t the first time a senior has ratcheted up his play in his final year, and although one cannot dare to expect a Rakeem Christmas-like surge, this is really Coleman’s year to shine. When asked what has changed over the last two games, Coleman says he’s getting more opportunities to score. Most importantly, he says he’s finding his spot. Though Coleman scoring in the paint is certainly helpful, with his size and position, he can make the biggest difference by pounding the glass and being aggressive on defense. 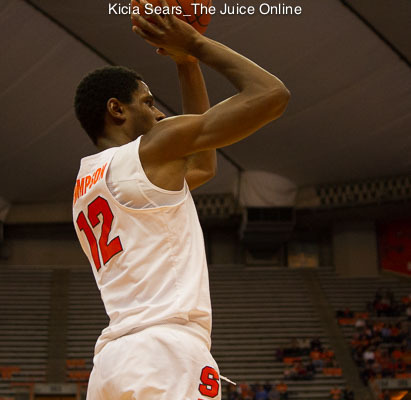 Syracuse head coach Jim Boeheim was reluctant to congratulate Coleman on his scoring, instead focusing on where he—along with the guards in his unit—can improve: rebounding, in particular. North Florida grabbed eight more boards than Syracuse, and nearly double the offensive rebounds. Boeheim didn’t seem worried, but emphasized the need to keep the energy up and remain focused. Whether Coleman can help, by getting—and staying—aggressive against tougher teams remains to be seen, but he’ll have his chance on Monday night: the Orange take on old Big East rival UCONN at Madison Square Garden.